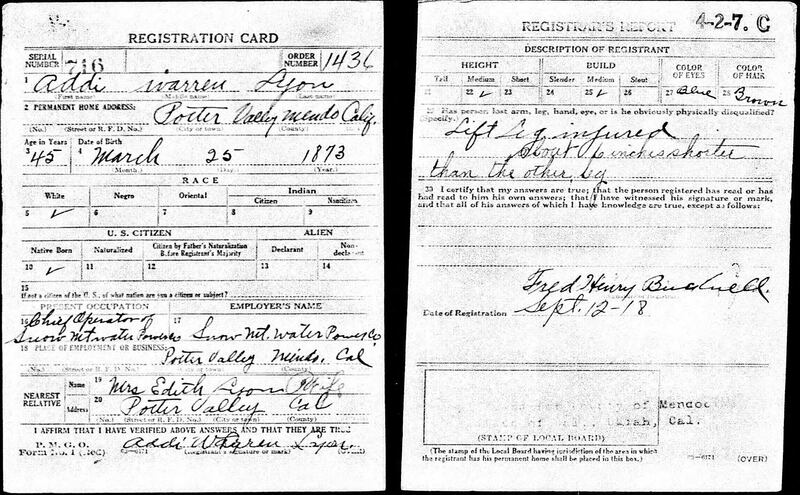 SCVHistory.com | Obituaries | Addi W. Lyon, L.A. Bureau of Water Works and Supply, 2-25-1951. Addi W. Lyon Dies Suddenly. The Newhall Signal and Saugus Enterprise, March 1, 1951. Death came quickly, almost painlessly, Sunday evening to Addi W. Lyon, electrical engineer of note, authority on the history of the upper Santa Clara Valley, and son of Sanford Lyon, original settler in the valley. Retired for a number of years, he had spent Sunday outdoors about the new home which he had built on the south slope of Lyon canyon — a home with a magnificent view out across the valley where he was born and which he loved. Coming into the house about nightfall, he complained of feeling badly, and a few moments later had a sharp seizure of pain in his chest. His wife became alarmed and called the Ecker ambulance to take him to Community Hospital. Here he appeared to rally somewhat, but was advised by Dr. E.C. Carroll to remain for the night. As he was entering the room assigned to him he suddenly slumped down and lost consciousness. The 20-30 Club respirator was brought to the hospital by Ed Hilburn, but attempts at resuscitation proved vain. The end came through coronary heart attack. 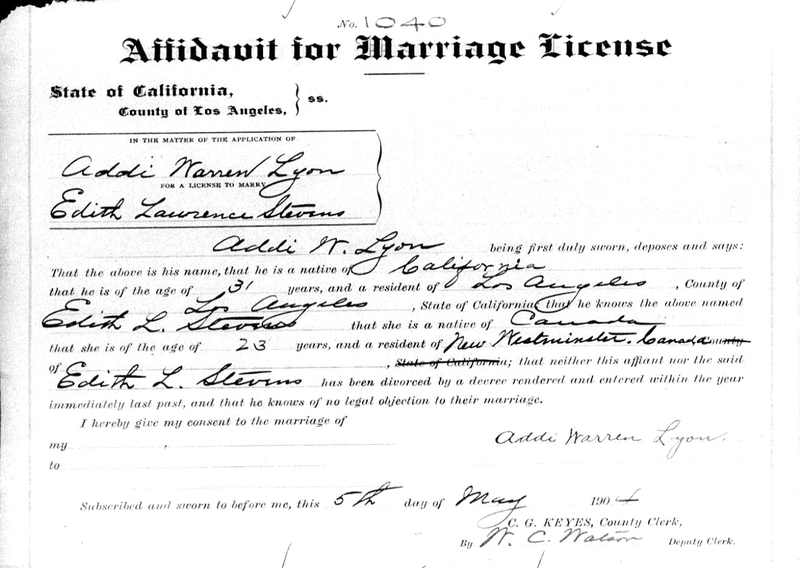 Addi W. Lyon was a true native son of California, and a member of a family whose records run back to the first American occupation of the state. His father, Sanford Lyon, came to California in 1849 in a sailing ship around the Horn, and a short time later established famous Lyon Station, gateway to the Fremont Pass. Addi was born March 25, 1873, at Lyon station, but as a babe went to live with his parents at the Lyon ranch which had been homesteaded by his father in the canyon on the western rim of the valley, which took the Lyon name. He attended school at the first school to be established in the valley. His father died when he was 8 years old, and he went to Artesia to live with relatives, finishing his common schooling these. He attended old Los Angeles high school, and after graduation there matriculated at Stanford University. He was graduated from this institution in 1899, with the degree of B.E.E. (Bachelor of Electrical Engineering). While at Stanford Mr. Lyon made many friendships which endured through his life. He became acquainted with Lou Henry, who later became Mrs. Herbert Hoover, and with many men who later became prominent in California affairs. 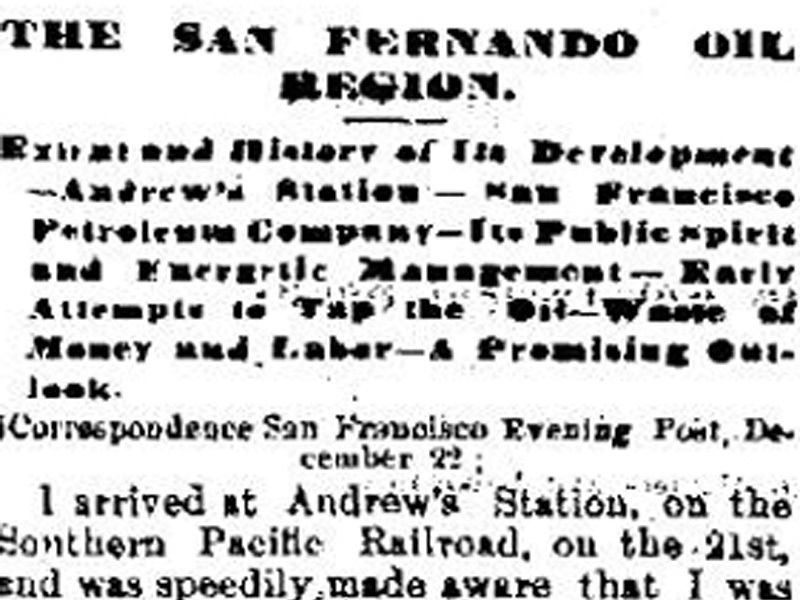 He took a position with the Pacific Light and Power Company, one of the early utilities. He became chief of the first hydroelectric plant in the state on the Kern river, and it was to this remote station in 1904 that he brought his bride, Miss Edith Stevens of Pasadena. Later Mr. Lyon became connected with the Snow Water Power Company and spent several years with that company in Mendocino County. 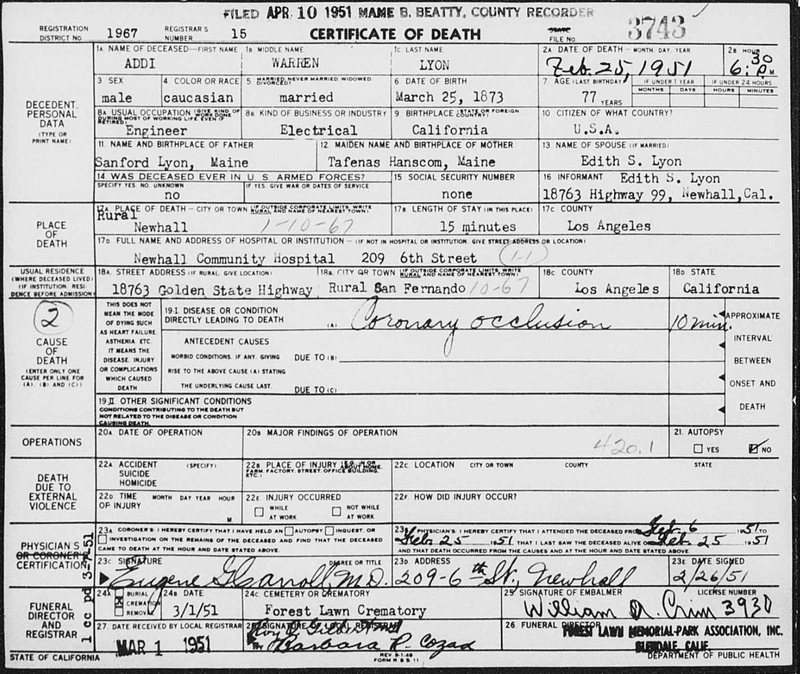 He then transferred to Los Angeles and affiliated with California Edison in 1918, later changing to the Los Angeles Bureau of Water and Power, with whom he remained until his retirement in 1941. For many years Mr. and Mrs. Lyon lived in the old home place far back in the canyon. About two years ago they started construction of the new home on the hillside. Mr. Lyon's memory was a storehouse of information on the early days in the valley. From time to time he would set his recollections down in writing, and they formed interesting and valuable contributions to the history of the area. The Signal published many of them. Of upright character and uncompromising probity, Addi Lyon was a gentleman of the old school. Throughout his life he upheld and exemplified the sturdy virtues and the high ideals and traditions of an older day and time. Personally his disposition was modest, courteous and affable, and he had a wide circle of friends, particularly among the older generation. 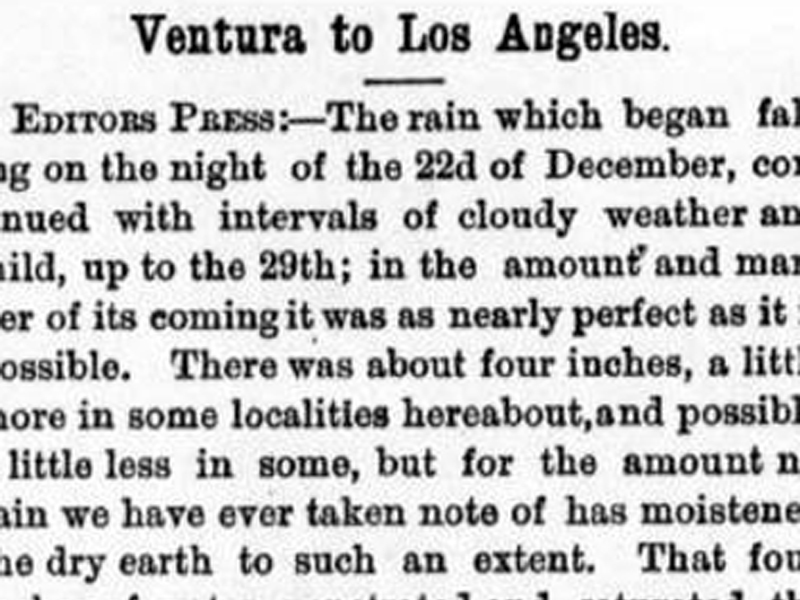 He is survived by his wife, Mrs. Edith Stevens Lyon, and one son, Lawrence Lyon of Van Nuys. Obituary and vital documents courtesy of Tricia Lemon Putnam. Click here to read about his debilitating accident as a teenager.